In today's Spokesman Review we have an article about new a test for explosives in order to get on an airplane. Kevin Donovan, the TSA’s acting federal security director, provided a demonstration of what the agency calls a “Explosive Trace Detection” machine. It’s now being employed in virtually all major airports across the United States partly in reaction to the failed Christmas Day attempt by a Nigerian man who tried to ignite an explosive device aboard a Northwest Airlines flight as the plane prepared to land in Detroit. It's only partly in reaction, but in reaction nonetheless along with the emphasis on body scanners. TSA agents use a swab on the passenger’s hand. The swab is inserted into the machine and within a couple seconds the machine tells the agent whether the person has traces of things that could be used as explosives, Donovan said. Additional screening has an ominous tone to it. The machine tests for residue, such as nitrates that are sometimes used in bomb making. However, farmers who recently handled fertilizer, hunters who fired weapons and those who use certain hand lotions can trigger the alarm, Donovan said. Certain hand lotions? That Avon lady is trying to get you in trouble! Did William Powell leave something out of the Anarchrist Cookbook. And let's not forget those who load their own ammunition. At the risk of stereotyping, let's angrify the Second Amendment faithful. That's to help make us believe this and all the other security theater acts really make us safe. No delay. Unless, of course, you are tagged for "additional screening". And besides, we all know that terrorists don't wash their hands thoroughly. 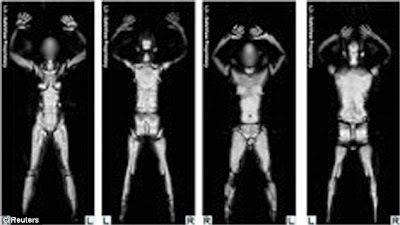 Here's an idea for the body scanner. A t-shirt with aluminum foil letters attached on the front that spell out "Check out these guns" and foil arrows pointing to the arms. On the back, "They're loaded". I should probably arrive really early for my flight, eh? Next time I fly, I plan to insist on being frisked.